Salvador Dali was well known as a bizarre and surreal artist in the 1900’s; his highly imaginative and creative mind has moved me to create imaginative concepts while out in nature. At times, I have composed photographs that make me wonder where my inspiration originates, however I find that in the moment of composing photographs there are no thoughts of another artist’s work, instead my artwork molds itself naturally and might notice the influence later. At the time this photograph was created five years ago, I heard of Dali’s name but did not know who he was and I had seen his artwork and absolutely loved it but never put the two together. Strong work can leave a lasting impression in a mind, especially when randomly coming across it every now and then. One thing I have always loved about Dali is the way he could annoy the critics. That always keeps me thinking out of the box by trying to please myself with work that might not please others. 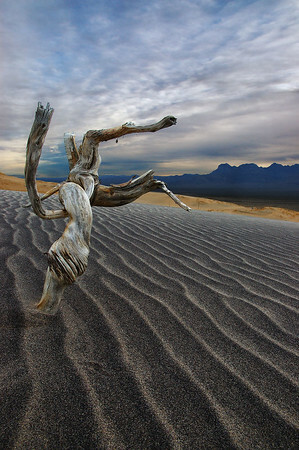 Placing a weathered branch in a sand dune straight up into the air may not be natural but does it need to be? This entry was posted on March 28, 2010 at 8:34 pm and is filed under Uncategorized. You can follow any responses to this entry through the RSS 2.0 feed. You can leave a response, or trackback from your own site. You hit on something that I’ve been questioning in my own mind – do you “capture” an image or “create” an image?? The Dali reference is perfect for this image Steve. I had noticed this on your site though didn’t put the two together until now that you mention it. Great texture in the sand as well. Derrick, I would have to say it is a lot of both create and capture. We capture the light that is given to us but we can create what we see and what we exclude. Excluding is just as important and including subjects and distractions. Richard, It might not be Dali that inspired me but I’m sure he has influenced so many that no matter where I came up with the idea it probably somehow comes back to Dali style of creating the bizarre. It is a very fine photograph, and unique to photography. I’ve heard it said that we find subjects of interest and the creativity is in selecting what to put in the photograph.